Take touchless to a whole new level of convenience. The Sensate touchless faucet frees your hands so you can speed through cooking and cleanup tasks while enjoying a cleaner, more hygienic kitchen environment. Sensate's intuitive Response(R) technology is in tune with your every move: a simple wave of your hand-or an object such as a pan or utensil-turns it on or off. The faucet's sensor is precision-designed to provide reliable operation every time and to prevent false activations when you're working in the sink area. Kohler's new docking system, DockNetik, secures the pull-down sprayhead to the spout using magnetic force. Black bonnet makes a striking design statement. Inspired by professional kitchens and cooktops, this HiRise pot filler faucet provides commercial-grade utility to home chefs. Fill your pots right where you need them, and avoid carrying heavy, filled pots across the kitchen. The deck-mount style and slim profile of this faucet leaves plenty of counter space for prep work, and the extended reach covers a wide area on your counter or stovetop. A higher-than-average flow rate quickly fills your pot with water. HiRise faucets combine the concepts of vintage plumbing with the strength and beauty of stainless steel to create truly sophisticated designs. This wall-mount faucet reintroduces a classic design that suits urban lofts as well as traditional kitchens. The high clearance of this gooseneck swing spout allows you to easily fit large dishes underneath for cleaning, and the wall-mount design saves space and keeps the counter clear for prep tasks. This faucet is outfitted with easy-to-install and leak-free UltraGlide(TM) valves for excellent performance. Sensate Ac-Powered Touchless Kitchen Faucet In Vibrant Stainless With Black Accents Take touchless to a whole new level of convenience. The Sensate touchless faucet frees your hands so you can speed through cooking and cleanup tasks while enjoying a cleaner, more hygienic kitchen environment. Sensate's intuitive Response(R) technology is in tune with your every move: a simple wave of your hand-or an object such as a pan or utensil-turns it on or off. The faucet's sensor is precision-designed to provide reliable operation every time and to prevent false activations when you're working in the sink area. Kohler's new docking system, DockNetik, secures the pull-down sprayhead to the spout using magnetic force. 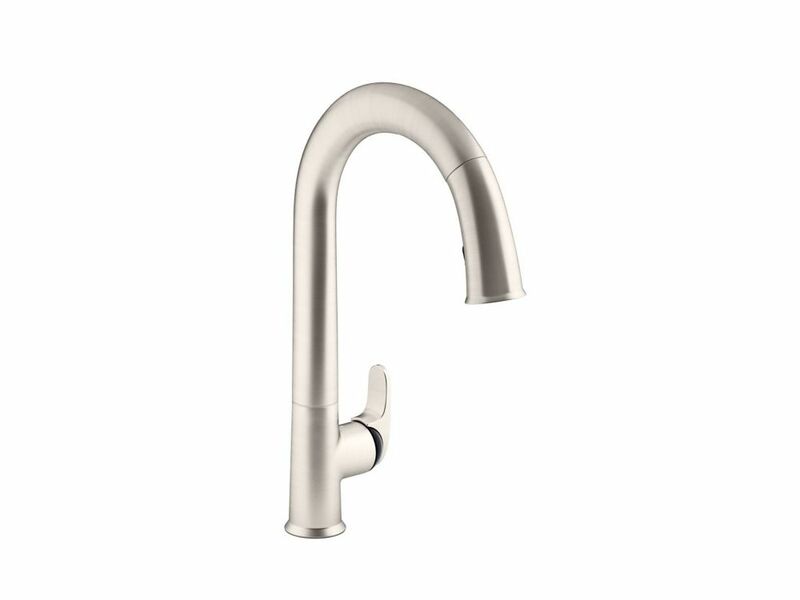 Sensate Ac-Powered Touchless Kitchen Faucet In Vibrant Stainless With Black Accents is rated 4.3 out of 5 by 3. Rated 4 out of 5 by Jazman128 from Good, but not perfect As a regular faucet, it's good looking and functions as expected. The cartridge to turn the water on, and adjust the hot to cold ratio is smooth and intuitive. The pull out nozzle also works well, with a cool swivel joint at the head which makes it easier to aim the nozzle where you want it without having to put a tight bend in the hose. The nozzle can be switched to normal aeration or spray with a toggle valve (it stays in that setting). My one complaint is that the spray setting has very small holes in the head resulting a forceful spray that easily bounces off items being rinsed and splashes water all over. I find I have to set the water volume to about 1/3 to rinse things with the sprayer without making a mess. Touch-less Features: The faucet has an indicator LED which is useful. Waving your hand under the neck toggles the faucet on and off. It is quite handy (and likely saves a little water) once you get accustomed to using it. One unfortunate consequence of the design comes when rinsing large pots, pans, etc. Passing the item under the neck inadvertently switches the faucet off. Installation: The installation is more complicated by the addition of an electronic shut off valve under the sink. You also need an outlet nearby (on all the time). I used an outlet powering my dishwasher, which is in the sink cabinet. The hose from the faucet to the shut off valve is only about 18" long, and I believe has to feed into the bottom of the shut off valve, meaning the shut off valve has to be mounted within 8" or so of the faucet. Sink drains, disposers and water supplies may make that placement difficult. There are a few electronic connectors and they're quite small, but my fat fingers were able to plug them into their respective sockets without much trouble. The final assemble went without a hitch and proved fairly easy. The electronic shut off valve (mounted under the sink) has a mechanical override feature, in case something goes wrong. It would be convenient to be able to mount the valve close to the front of the cabinet, but the short hoses mentioned above preclude this. Longer hoses would give more flexibility, but at the expense of an increased delay when using the faucet between adjusting the mixing valve and feeling the change in water temperature. Other note: The faucet does NOT come with an escutcheon to cover the typical three holes. This has to be purchased separately, if you need it. Lucky for me, the escutcheon from the previous faucet (not a Kohler) was acceptable to use. If not, the project would have had to be put on hold until I could order the part (it does not seem to be carried by any of my local plumbing supply shops). Value: It's a nice faucet, but difficult to know where it's price puts it the value category. I'm typically pleased with Kohler products, but have my fingers crossed that this faucet will perform flawlessly for many years, as servicing it (I'm sure) will not be fun. Time will tell. Time to install: I'd say the it takes approximately an extra hour to install this faucet, assuming you already have an outlet. I had to take some time to plan the layout. The construction of my cabinet also necessitated the fabrication of a mounting block for the shut off valve. Rated 5 out of 5 by Bloch from Highly Recommend I have zero complaints about this product. Love the finish which matches my stainless steel sink perfectly. The materials used are of high quality and feel sturdy while in use. The install instructions were easy to understand and clearly documented. Elsewhere, I read complaints regarding the sensor being somewhat like an airport terminal bathroom faucet, but I find that completely incorrect. The sensor is very responsive and intuitive.